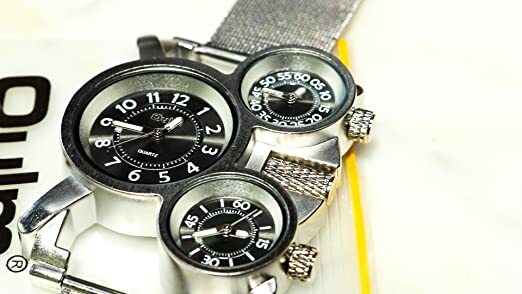 TRENDY & STYLISH: One of the newest trends that gives a sophisticated and fashionable look, this wristwatch is an ideal gift for your loved ones for any occasions such as Christmas, birthdays, anniversaries, Father’s Day, graduations, Valentine’s day, etc., or when you simply want to spoil yourself with something new and trendy. MILITARY GRADE QUALITY MATERIAL: Made of high quality alloy and metal material with mineral harden glass. Anti-corrosion, anti-scratch, and provides some water proof protection such as from sweat and rain. (Not waterproof for swimming, diving, or showering). QUALITY DESIGN FASHION: Includes a Japanese quartz movement dial and chronograph design. Unisex design wrists watch for men and women. VERSATILE & CONVENIENT: Includes a 3 Time-Zone display that you can glance at for quick reference. CUSTOMER SATISFACTION: If you’re not 100 satisfied with our watches and wristwatches you can return it for a full refund no questions asked! We take pride in our customer service and we will do whatever it takes to make you happy.